As I listen to the news coverage about all the unaccompanied minors coming from Central America, what I mostly hear is worry about how to house them, how to handle the legal ramifications, how to pay for them and how to stop them from coming across the border. What about worrying if they are OK? I get that this is an immigration problem, a legal problem and an outrageous logistical problem. But first and foremost, it’s a humanitarian problem. These are children. Children who have been traveling alone, or with shady people they don’t know. They are coming to find their families — or they are fleeing violence and poverty we can’t even imagine. They aren’t coming to take jobs away from Americans or as part of an immigration loophole strategy. They are coming for a better life — but truly, can you be angry at a child for not wanting a life of violence and poverty? In many cases these children are being kept in make-shift enclosures until the officials who have to deal with the mess can find their parents in this country, or at least someone who would be willing to sponsor these children and help them find a place to live and meaningful work. This is a process that can take months — years in some cases. In the meantime, the kids are supplied with books and paper and crayons and they draw pictures of the land they soon hope to be a part of, complete with American flags dotting the foreground. Like their parents, and like so many of our ancestors, they dream of America, the land of the free. And while the conservative element in this country fret over the amounts of money it will take to relocate or (in their minds, preferably) send those kids back where they came from, to the violence, the corruption, the gangs and traffickers in prostitution, there on the border, hiding behind masks, are growing numbers of heavily armed, self-appointed guardians of the turf, determined not to allow those children set foot in “their” country — forgetful of the fact that not so long ago they also sought a safe haven where they could live and breathe as free men. There is, apparently, a slight majority of Americans who want those kids to be welcomed and rejoined with their parents in this country. This small majority is mostly silent and stands in the background unobtrusively while the watchful guardians of what they regard as the American way present the ugly face of America at its worst. I am reminded of Hanlon’s Razor which tells us “Never attribute to malice that which is adequately explained by stupidity.” Stupidity and fear, a fear that is growing like a weed in this country and bringing out the worst form of insect from under the rocks in an angry mood and well-armed to boot. In the meantime, the kids wait and the Congress prevaricates — which they do so well — fearful that taking any humane steps might damage the chances of their membership during the coming mid-term elections. Better to do nothing than to do the right thing, the humane thing, the thing that has made this country great for over two hundred years. In a most interesting follow-up to Chuck Hagel’s recent narrow endorsement by the Senate which launched this Republican into the Secretary of Defense seat, HuffPost’s Jon Soltz wrote a resounding endorsement of the man and made some intriguing points as well. 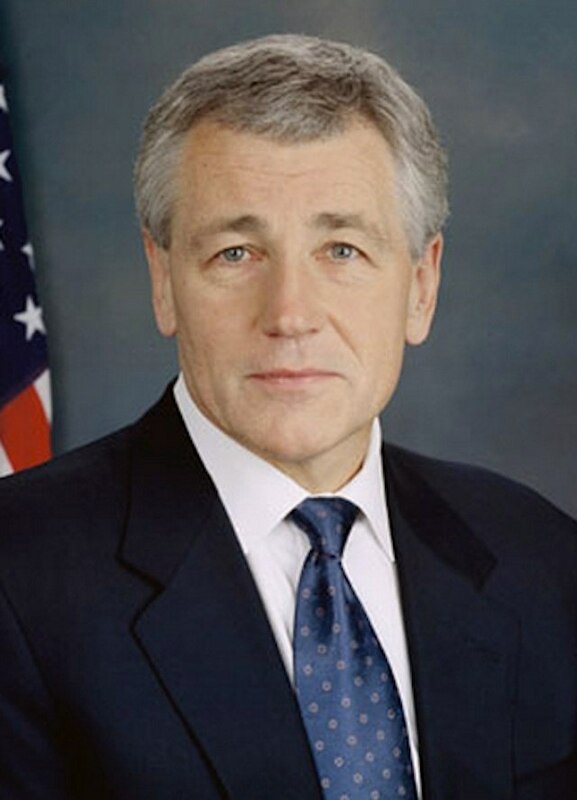 To begin with, he thinks the appointment bodes well for veterans and for the Department of Defense generally since Hagel is the right man for the job and his position has been strengthened by the ordeal he has been put through. Further, he thinks it will be fun to watch those Senators who attempted to smear Hagel’s reputation and bring him to his knees kiss up to Hagel in an attempt to curry favor with a man who is now in a position to improve their political fortunes by sending defense contracts their way — or not. What goes around comes around. Politically, the faux fight over Hagel’s nomination has dramatically shown a Republican Party in complete disarray, in the midst of their own civil war. On one hand, there are some Republican senators who, today, put the nation above politics, and refused to engage in sliming a great American veteran. On the other hand, there is an increasingly shrill fringe right who, in conjunction with the same neoconservatives who led us into Iraq, continue to show that they will put anything — even American security — below their own self-aggrandizement and continued campaign to oppose anything the Obama administration says or does. Davis says “[Graham’s actions against Hagel] masks votes Graham has taken that conflict with small-government ideals. Graham voted for the bank bailout, once worked on climate change legislation and voted for the recent fiscal cliff deal that allowed taxes to rise on the wealthiest Americans. We have all known for some time that this group of nutters marches to its own drummer — a drummer, by the way, with no sense of rhythm whatever — and we can only hope that they will soon march right out of the political picture as just another bad dream that we will all wake up from with a start. I say again: we can hope this will happen. But they have the Big Bucks behind them and they are nothing if not fanatical about what they regard as their “cause” — which is euphemistically called “small government.” Their dream is to live in a country where they can increase their immense wealth with minimal government interference, even though they want a gigantic military behind them for protection and are always among the first to cry for help when their business interests are threatened. Davis’ comment that Graham is not “the type of Republican we need in Washington, D.C. right now” couldn’t be more wrong. The kind of Republican we all need in Washington right now is precisely ones who have no allegiance whatever with the neo-cons and their wealthy backers. This country was founded on the sovereignty of the people, not the few wealthy nut-cases who want everything to go their way and will resort to extortion to make sure it happens. I don’t pretend to understand all the ramifications of the “deal” struck in Congress recently to keep us from going over the fiscal cliff. But the complaints from the political right-wing suggest that the deal was a good thing for the rest of the country. I figure if the Tea Party doesn’t like it, it must be a good thing for the majority of people in this country. I do wonder, however, whether it might have been better in the long run if we had fallen off the cliff — on our collective butts — in order to force this country to eliminate some of the fat in our budget (starting with defense spending, of course) and make all of us pay more taxes — given the fact that we are taxed at a very low rate compared with the rest of the “developed” world, and also given the fact that our economy thrived when we were paying more in taxes. I was especially hoping for tax raises on the wealthy who have benefitted mightily from the Bush tax cuts. As I understand it, the new deal will raise taxes on individuals who make above $400,000 a year and that will help reduce the deficit somewhat. But a great many people who make a great deal of money will still avoid paying their share. Legislation passed by the Senate late Tuesday night will limit the amount wealthy people can claim for charitable deductions on their taxes. While some say donors shouldn’t be motivated by the amount of money they can write off, others –- including some nervous nonprofits –- argue that tax breaks for charitable giving should have been left untouched in the deal. When I was a kid I loved playing marbles. We played “keepies” where the winners get to keep the marbles they hit out of a ring drawn in the dirt. Every now and again a kid would see that he was losing and grab his remaining marbles and refuse to play any more. This is what Fleischer’s complaint reminds me of. Wealthy people like Ari Fleischer don’t want to play any more because they won’t get the tax breaks they are used to getting for giving some of their money to those less fortunate than themselves. Poor Ari. I expect he cries all the way to the bank. I thought the idea behind charitable giving was to help others, not to get tax breaks. Great wealth seems to cloud the brain. And on Monday, a gathering of the nation’s top defense executives took a surprising turn when they endorsed tax rate increases on the wealthy and cuts of up to $150 billion to the Pentagon’s budget. Top executives from Northrop Grumman, Pratt & Whitney, TASC and RTI International Metals appeared at the National Press Club at an event organized by the Aerospace Industries Association, the top defense contractor lobbyist. David Langstaff, CEO of TASC, said that the executives were speaking out because so far leaders of the defense industry were “talking a good game, but are still unwilling to park short-term self-interest.” After the event, he told a defense reporter for Politico that tax rates need to go up. And apparently there are a number of other key members of the wealthiest classes in this country who agree with Fred Smith and David Langstaff. This is truly quite remarkable. Cut military spending? You must be kidding me! It can’t be April Fool, but it may be a Christmas miracle! Not so. As expected, the Congress hasn’t given any sign that they will move on the question of continuing the tax breaks for the very wealthy which many believe are the reason we are in such a financial pickle. Led by intransigent Senators like John Thune and Marco Rubio, who would apparently just as soon see us fall head-first off the fiscal cliff, the Republicans in the Senate are adamant that there will be no rise in taxes on the rich — even if they want them. Now there’s the kind of enlightened, inspired leadership the founders were hoping would rise to the top like cream in a milk bottle. Oh, that’s right, the scum also rises! Ryan’s budget proposals affect the support of seniors, cut assistance to programs aimed at combating childhood hunger, and would leave people who have lost their jobs without heat during cold winter months. This isn’t hyperbole but reasoned analysis of his budget goals from non-partisan groups like the Center on Budget and Policy Priorities. Ryan’s plans would eventually end “everything from veterans’ programs to medical and scientific research, highways, education, nearly all programs for low-income families,” according to the CBPP. The Presidential race that was becoming boring in spite of the millions of dollars that have already been spent on it has just become a race of major importance. It now matters a great deal whom we vote for. While Obama has shown himself to be weak on environmental issues, too quick to wage war, and unwilling to take on the corporations that support him, he is certainly preferable to a man who is openly avowing a public strategy to eliminate the middle class, eradicate the E.P.A., and turn the government’s back on the poor and needy in this country. As Rev. Currie points out, this election has suddenly become a matter of extreme moral import: it’s not just a choice between Tweedle-Dum and Tweedle-Dee as it may have appeared at times. The movement to cut taxes at all costs and eradicate protective agencies is disturbing on so many levels it is hard to know where to begin. To the extent that we support this movement, it shows us to be a greedy and self-serving people who lack compassion for our fellow human beings or concern for the planet itself. This sounds like exaggeration, but it is not. The time to attend to the issue of global warming, for example, was months ago and we still have largely ignored it — while many continue to deny it. But the attacks on social programs that assist people in real need are in many ways even more disturbing. The nonpartisan Center on Budget and Policy Priorities, for example, estimates that 62 percent of Paul Ryan’s cuts as Chairman of the House Budget Committee were to programs for the poor. The frenzy to cut taxes by a people who pay less than most others who enjoy the benefits of a “developed” country shows us as a people unwilling to consider the real costs involved: our stewardship of the planet and a concern for human suffering and genuine human needs. I really cannot believe we are at that point. My suspicion is that Mitt Romney has made a huge blunder in picking Paul Ryan as his running mate and that the American voters will see that this man represents the reductio ad absurdum of Mitt Romney’s political thinking. Surely this approach to politics will be deemed unpalatable to the majority of voting Americans in November.